Is Cardi B playing us, or are her hints for real? 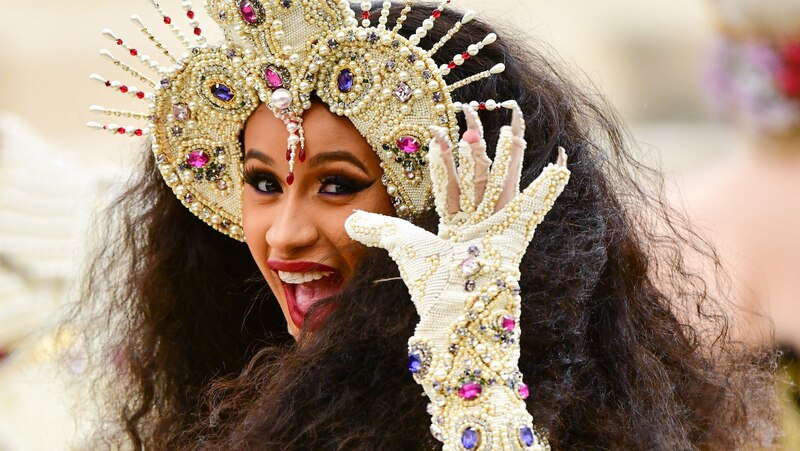 The rapper chatted with The New York Times before Monday's huge 2018 Met Gala — themed "Heavenly Bodies: Fashion and the Catholic Imagination" — and she referred to the baby on the way as "she" numerous times. Hmmmmmm. Cardi also seemed to suggest a little girl was in her future when she chatted with Entertainment Tonight'sKeltie Knight on the Met Gala red carpet. "Oh, she wants to fight me!" Cardi joked when asked about her baby's movements. She added, "[My dress weighs] about 35 pounds plus baby. It's OK though, I used to go up the project stairs." Cardi B confirmed she was expecting her first child with rapper Offset on SNL in April. Cardi said during a radio interview with New York’s Hot 97 she's already chosen a name for her baby and believes Offset will be a great dad. “God forbid,” she said about their relationship ever ending. She continued, “My man is a great father to his kids. I will never lose. I’m not having a baby with a deadbeat." Offset's given name — Kiari Kendrell Cephus — is pretty fantastic too, so we can't wait to hear what these guys name their little one. We're thinking the moniker will be memorable to say the least. During the radio interview, Cardi B said she had no patience for haters who question the timing of her pregnancy. And we support her wholeheartedly. Agreed. You do you, Cardi B. Haters gonna hate, but we're all ready for any invite you want to send out for your baby shower. We give really nice presents.